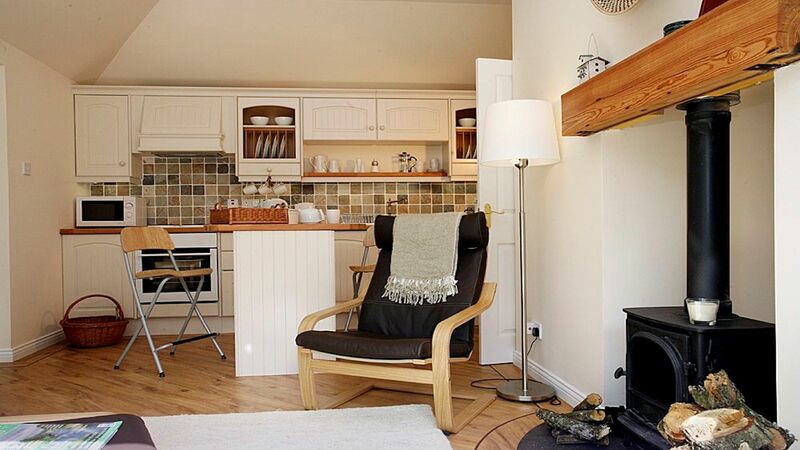 A charming secluded dog friendly holiday apartment for couples, set in woodland beside an 18th Century Doo’cot, within walking distance of the conservation village of Dunning, and with views towards Craig Rossie and the Ochil Hills. 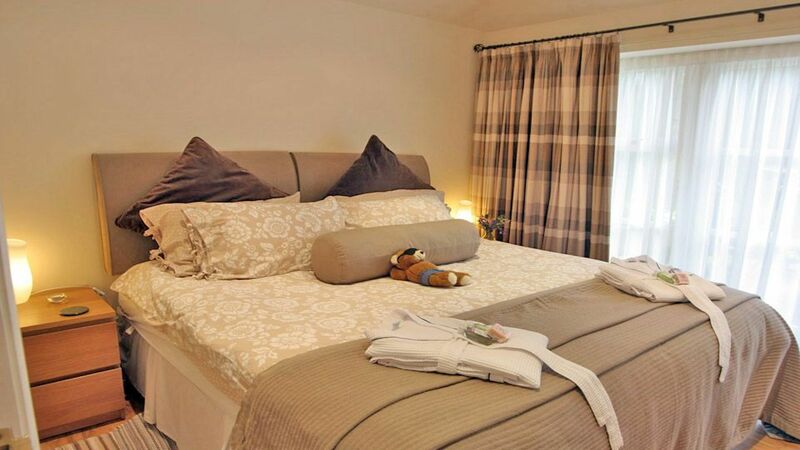 The cottage’s clever modern design provides everything that a couple on holiday could need. Rollo Park for dog walking is close by. You could play a round of golf at the end of the garden on the 9- hole local course or perhaps the more challenging course at the five star Gleneagles courses nearby. ​You can feast on our home grown fruit and vegetables or try our free range eggs while spending your days exploring the locality. The Rollo Park is next to the cottage and owners can walk dogs there, around the village and to the Community Wood at Kincladie on the east side of the village. 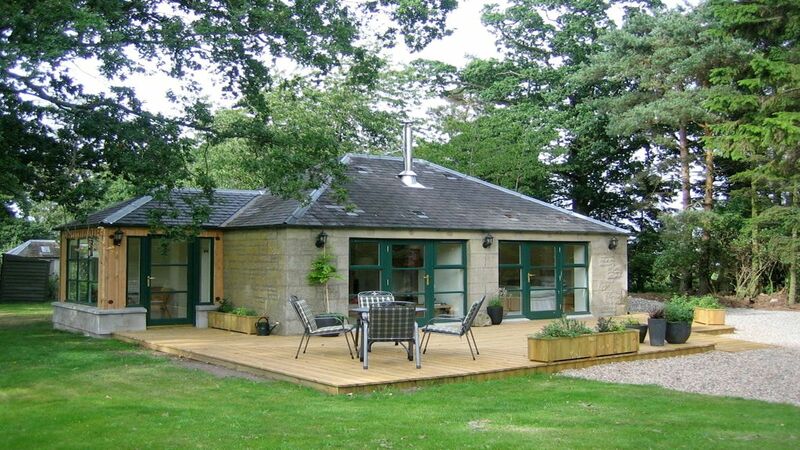 The Doocot is a delightful and secluded cottage, set in woodland beside an 18th Century doocot, where you can enjoy the quiet, peaceful surroundings. 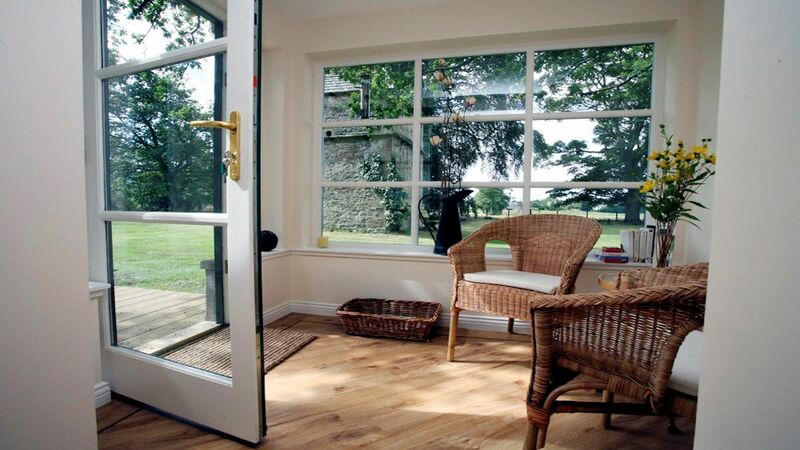 There are stunning views of fields and the Ochil Hills from every angle whether you are enjoying an evening glass of wine in the conservatory or breakfasting on the deck. You could warm your toes beside the log burning stove while gazing out through the french windows or lie in the hammock and watch the … sheep … go by! Parking is available directly outside and there is level access to the accommodation. A decked area outside provides a great place to sit out and enjoy summer evenings. The cosy lounge features a television, DVD player and log-fire, a small kitchen for preparing food and breakfast bar. There is a bathroom with bath and shower over the bath, toilet and sink. One king-sized bedroom provides accommodation for couples. The village of Dunning is only a short walk away (around 500 yards/ 5 minutes walk) and boasts a fine pub (or two! ), a Nisa store and Post Office, golf, tennis and the site of the last burning of a witch in Scotland! Also a popular visit is to Historic Scotland run St Serfs Church, open from April to end September, where you can enjoy excellent guided tours of the Dupplin Cross. The Cross is thought to be Celtic in origin but its origin is uncertain. We are only an hour by car from both Edinburgh and Glasgow and 15 minutes from Perth. The Doocot is centrally placed for day trips to the Highlands or for forays over to the west. The East Neuk of Fife and St Andrews are an hour away – so you could spend one day on the beach and the next hill walking in the Highlands. The City of Perth is 9 miles away, providing shops, restaurants, an Art Gallery, the J D Ferguson Gallery, the Black Watch Museum, St John’s Kirk and the world-renowned Horsecross Concert Hall. There are lovely walks by the River Tay and on Kinnoull Hill. The Doocot is an ideal base for any length or type of stay; whether it be holiday or business, a long weekend or a fortnight you can be assured of a very warm welcome. 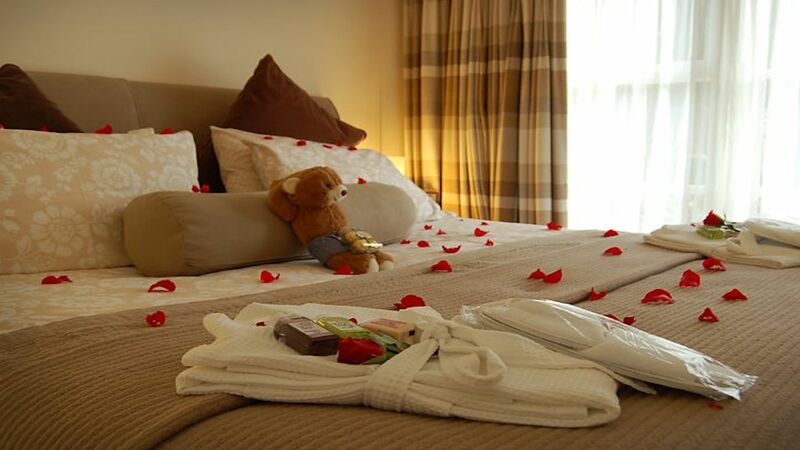 The owners will do their best to make your stay both enjoyable and memorable.